At Story Planet, we believe that books can shape us and open us up to new and amazing experiences. 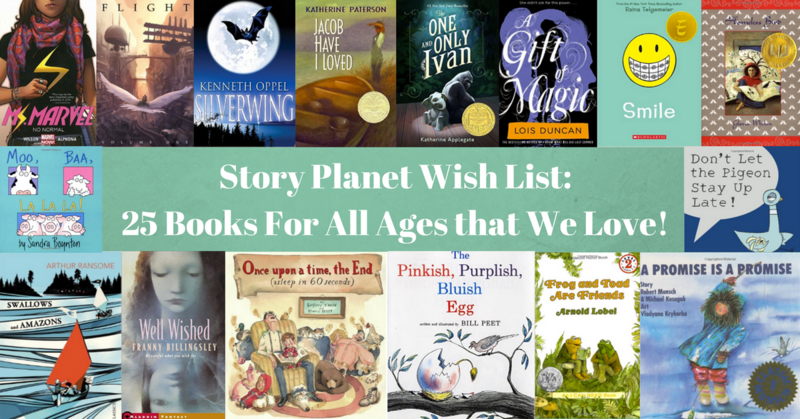 Some of our best memories are of the books we read growing up, or the books we read to our own children, and we wanted to share some of those with you. Whether you’re looking for a great gift or just want to know what that next library book should be, the following books are some of our most deeply loved and cherished. We hope you love them as much as we do! If you purchase any of the books through the links below, Story Planet will receive a small commission from Amazon. Any funds Story Planet receives will go towards running workshops and creating amazing programming for children and youth in under-resourced communities all over the GTA. Your purchase can help kids gain access to arts-based programming and keep Story Planet’s mission alive. Why we recommend it: I love reading this book to my niece as t has an empowered female character, and it teaches that things are not always what they seem. Why we recommend it: Hilarious story where the pigeon convinces the reader why he should get to stay up past bedtime. Why we recommend it: Rhythm, hilarity, dancing cows. This is a favorite read aloud for kids under 5. Why we recommend it: We must have read “Tuck Go Bumpa” 5,000 times before my son turned 3 and I never got tired of it. Why we recommend it: I cannot remember how many times I forced my poor parents to read this book to me. I LOVED it. If you have a young person in your life who adores animals, this book is for them. Why we recommend it: This book is filled with beautiful illustrations and is by one of my all-time favourite childhood authors, Robert Munsch. I remember even being a little scared by this story, but the main character is a fantastic heroine who uses her wits to save the day! Why we recommend it: Because it’s a heartfelt story woven together with bouncing rhymes and beautiful pencil crayon illustrations. Why we recommend it: Three adorable tales of friendship, two amphibians living in the forest. Why we recommend it: A hilarious send up of fairy tales and rhymes, as read by a tired parent trying to cut bedtime short. Why we recommend it: This book features a fantastic heroine who has a great imagination and sense of curiosity – and she’s a scientist! Why we recommend it: I loved the idea of all these kids being on an adventure with no adults, sailing and visiting an island and causing trouble with another group of kids (Amazons). Why we recommend it: My mother always gave me books for Christmas while I was growing up, and this was one of my favourites. I loved the main character, who was an ordinary girl just like me, but in extraordinary circumstances. It’s set in India, so it also introduced me to a country and culture I knew little about. Why we recommend it: Magical and beautiful and gripping story of what happens after Nuria makes a wish in the darkly mysterious and unpredictable wishing well in her town. Why we recommend it: This amazing story, told in first person from Ivan’s (a silverback who lives in a “zoo”) innocent and curious perspective, was the first novel my 10 year old son read, and then reread. A truly wonderful story. Why we recommend it: Raina Telgemeier’s wonderful graphic novels capture the humour and “drama” of everything from being a sibling to getting braces. She writes with a warmth and connectivity that truly resonates with both boys and girls. Why we recommend it: Because it’s about magic! Why we recommend it: Oh boy, if you want a story that will make you cry, this is the one! A powerful story about learning to love yourself. I read this at age 12 and have never forgotten it. Why we recommend it: This was one of my favourite series growing up! The world Kenneth Oppel creates is so rich and real, and his storytelling kept me riveted from beginning to end. Why we recommend it: This is a really great piece of work that pushes boundaries and allows for fresh new perspectives on superheros. In this comic, Ms Marvel is a young Muslim American girl named Kamala Khan and she explores what it means to be a superhero in her own life. It’s really inspiring and innovative, and it deals with a lot of important issues for today’s context. Why we recommend it: A collection of short stories from up and coming Cartoonists and Illustrators, filled with beautiful and diverse artistic styles.